Victoria, Jentery, and I recently wrote a piece on the process of making an Optophone Kit, which is the third kit in the MLab’s Kits for Cultural History series. Titled “Remaking Optophones,” the piece was published in the Digital Rhetoric Collaborative (DRC) series on makerspaces and writing practices. 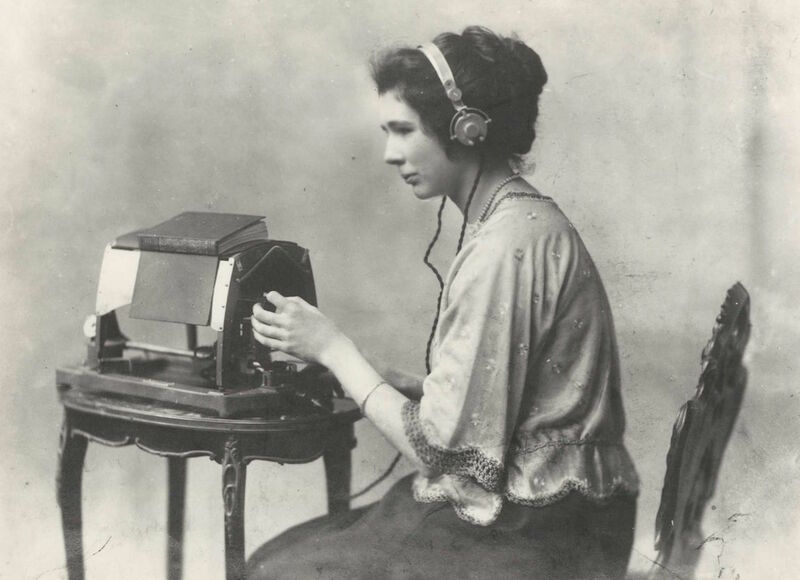 The reading optophone, which existed in multiple forms throughout the twentieth century, was an aid for the blind that converted text into sound. At the Lab, we are currently remaking one common configuration of the device, popularized by one of its first operators, Mary Jameson, that involved operators placing print materials on glass. They then used a handle to move a reading head located below the glass, sliding it back and forth to scan pages. As pages were scanned, the machine would express the type as a series of audible tones. To listen, operators plugged telephone receivers into the device and wore them over their ears, like headphones. Through hours of practice, operators learned to interpret these tones as corresponding letters or words. Mary Jameson reading Anthony Trollope’s The Warden on an optophone, ca. 1921, care of Blind Veterans UK. Building off work by Mara Mills, Matthew Rubery and Heather Tilley, and Robert Baker (archivist at Blind Veterans UK), we hope to better understand how optophones changed over time by remaking one with particular attention to Jameson’s contributions to not only optophonics but also early optical character recognition (OCR). More on this process over at the DRC. We would like to thank Jenae Cohn and the DRC team for their support and feedback on this piece. Post by Tiffany Chan, attached to the KitsForCulture project, with the news and fabrication tags. Featured image care of the Digital Rhetoric Collaborative.